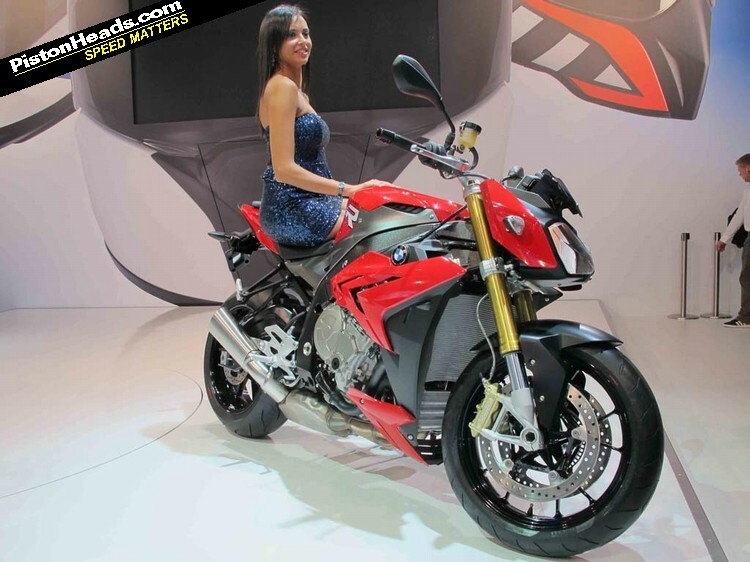 Star of the Milan show was the new and naked S1000R. Featuring an S1000RR inline four engine with a claimed 160hp and 83lb ft of torque, BMW has 're-tuned' the motor, given it more bottom end and dropped the red line by 2,000rpm. 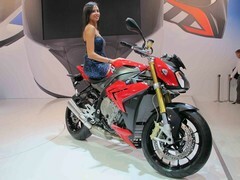 Also new from BMW is the R1200RT, which uses the new water-cooled GS motor. Like the GS the RT makes a claimed 125hp with 92lb ft of torque and features two power modes, ASC and even a 'hill start' control, making stopping and starting on a slope easier. The RT also gains a very cool gear shift assist that means you don't have to touch the clutch on up or down shifts as the ECU does it all for you by matching the torque and revs. 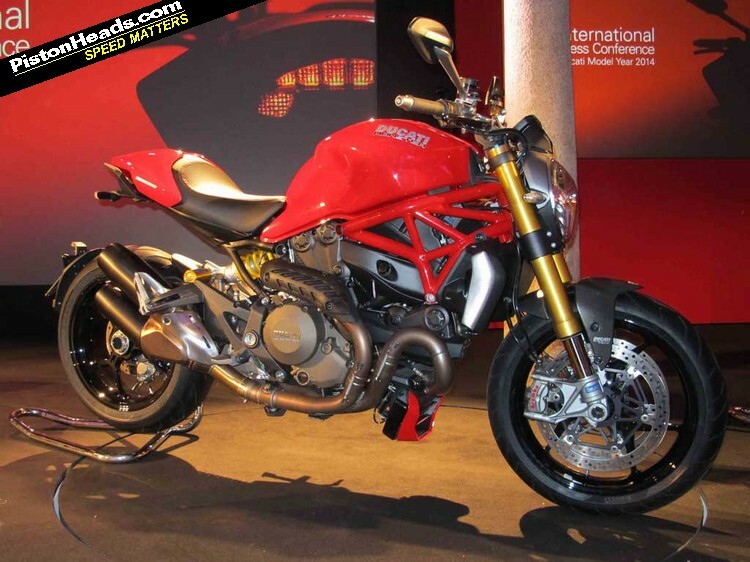 Only one bike from Ducati, the new Monster 1200 in standard and 1200S guises. Both bikes use a water-cooled Testastretta 11-degree engine with variable fuel modes as standard; however the S gets a 10bhp power boost over the stock bike's 135bhp due to ECU changes. In addition, S owners receive the traditional Ohlins upgrade as well as some carbon parts. 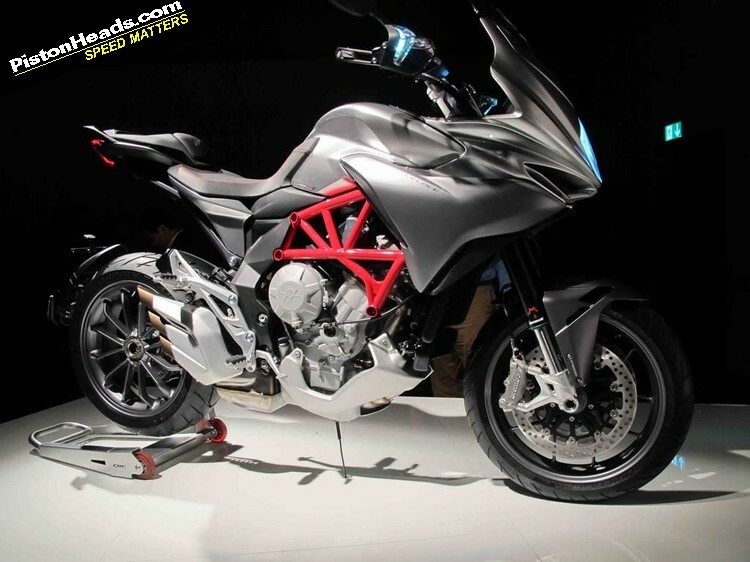 Ducati claim to have made the Monster even more user friendly and practical with an adjustable seat height of between 785 and 810mm as well as touring accessories such as panniers. Hot on the heels of the MT-09 triple is the MT-07. A totally new 689cc parallel twin, this machine is a lightweight naked that weighs 164kg yet makes a claimed 50lb ft of torque. The engine has a 270-degree crank layout for 'character' and a 'cross-plane feel', while the chassis is a tubular steel design with an asymmetric swing arm, horizontal shock and 41mm forks. Price will around the £5,500 mark. Also new from Yamaha is the MT-09 Street Rally, which is a supermoto body kit a dealer bolts on to your MT-09, the relaunch of the SR400, electric suspension on the Super Tenere and a three-wheeled scooter concept. 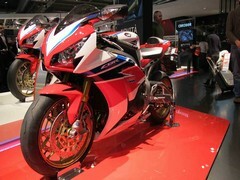 Yep there's a new Fireblade. In fact there are two! The stock bike has been updated with some small cylinder head and ECU mods boosting power by 3hp and increasing midrange. But far more exciting is the SP. 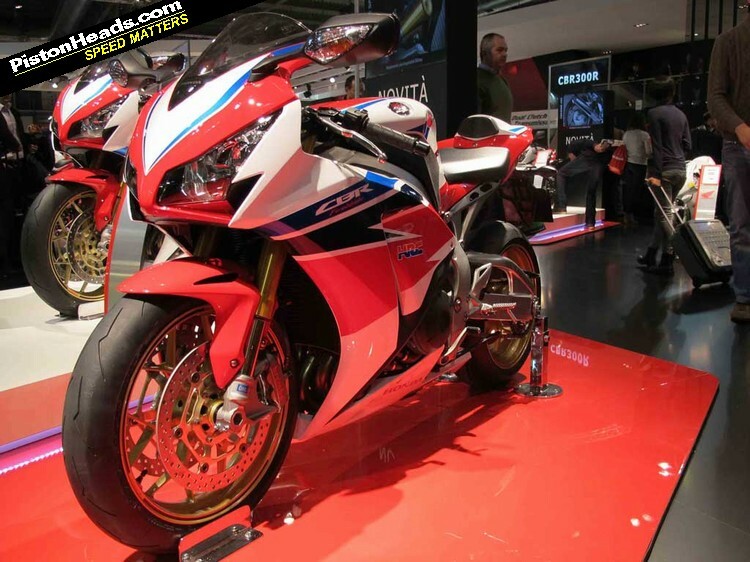 The first time Honda have created a Fireblade SP model, this new bikes gets Ohlins suspension, Brembo monobloc brakes, single seat unit, sportier pegs, new wheels and a 'balanced' engine. Honda have also revamped the CBR600F and CB600F to new 650 capacity models, given the VFR800 a thorough going over with a new look, increased the NC700s to NC750, the CBR250R is now a CBR300R and there are a few new cruisers. 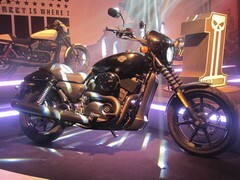 For the first time in 13 years, Harley-Davidson unveiled a brand new platform of motorcycle at Milan – a water-cooled 750 V-twin. Actual details were fairly sketchy as it is a late 2014/early 2015 model, but PH2 did some digging. The bike is powered by a Revolution-X 750cc water-cooled 60-degree V-twin with 4 valves per head and cam chains rather than the traditional Harley pushrods. Aimed at a younger customer who doesn't care too much about tradition, hence the fact it isn't a 45-degree motor. The Street, which also comes in 500cc format for other markets, will be an entry level bike priced below the Sportster 883; however, it will produce roughly the same, if not a little bit more power. 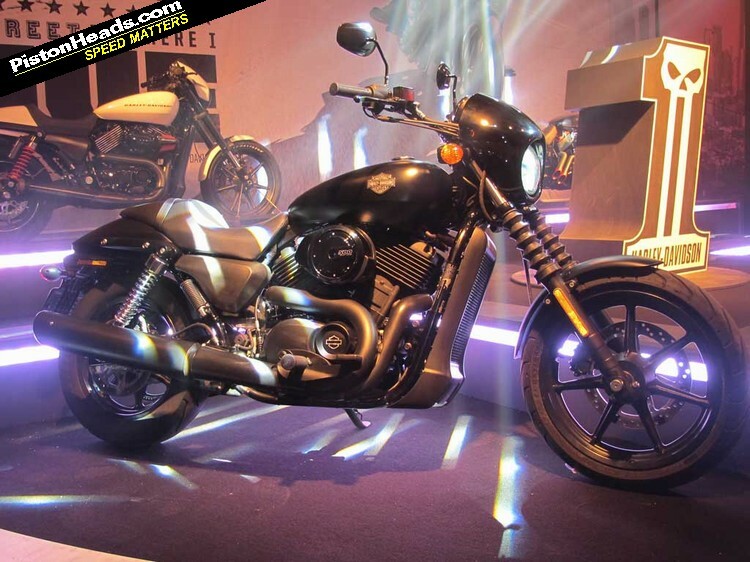 Two new bikes form Triumph, the Thunderbird Commander and Thunderbird LT. Despite looking pretty similar to before, these bikes have been thoroughly reworked and feature a new frame, revised suspension and a new exhaust system. The Commander is a more aggressively styled muscle bike while the touring-orientated LT comes with panniers, white-wall Avon tyres and a screen. However at the end of the press conference Triumph made everyone stop and listen. 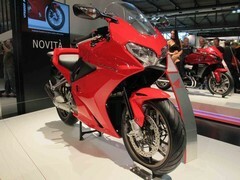 Announcing it will increase its investment in new models substantially in the coming years, the company also confirmed it is building a 250cc single-cylinder bike that will appear in 2015. 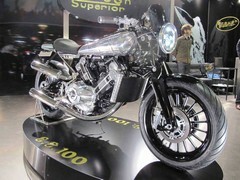 While spy shots of this machine have been seen, the picture Triumph showed was of a faired 675-syle bike. 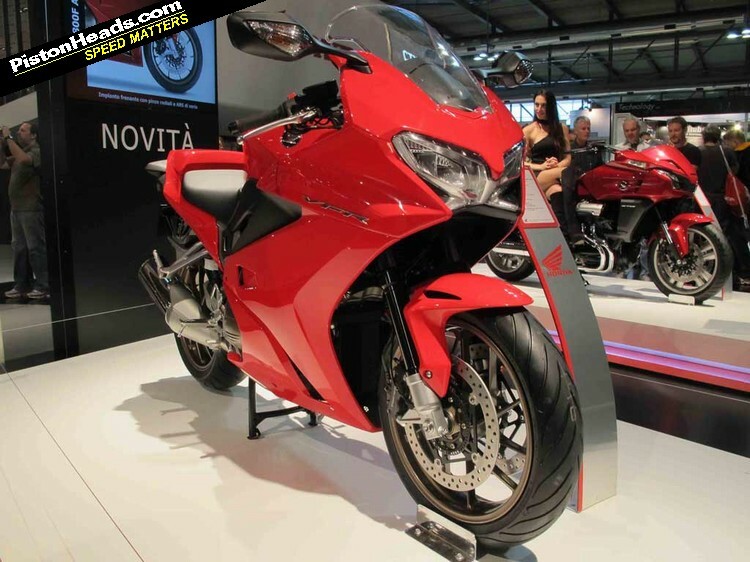 Before Milan there was a lot of talk of a ZX-10R-engined Z1000 – sorry, it didn't appear. 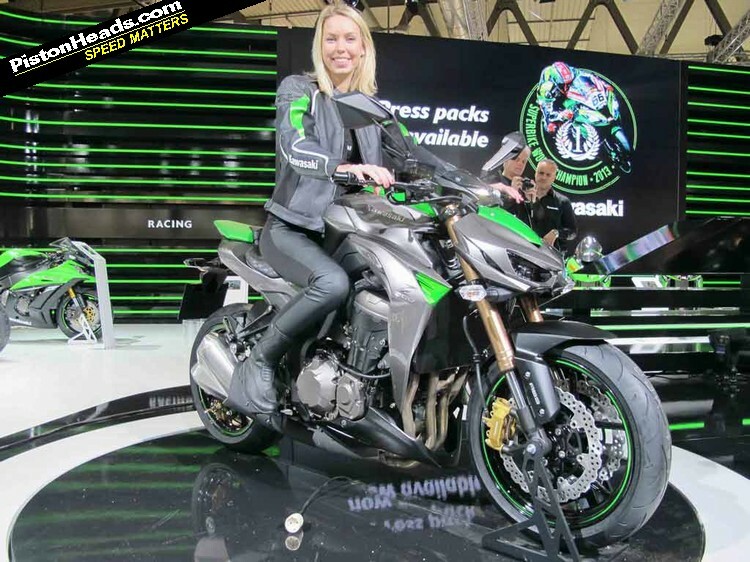 More a re-work than anything else, the new Z1000 has had its engine revised with new cams, ECU settings, exhaust and airbox mods. 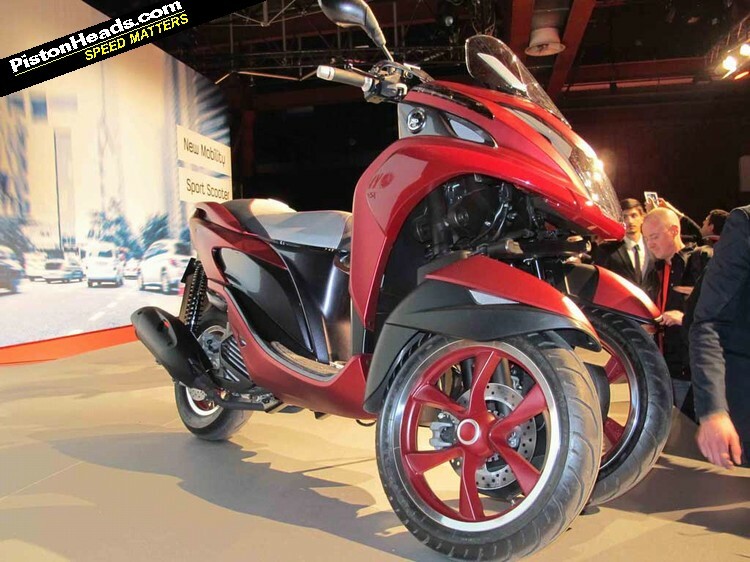 The chassis get Showa BPF forks, monobloc calipers, optional ABS and a funky new look. Also new is a Kawasaki scooter. 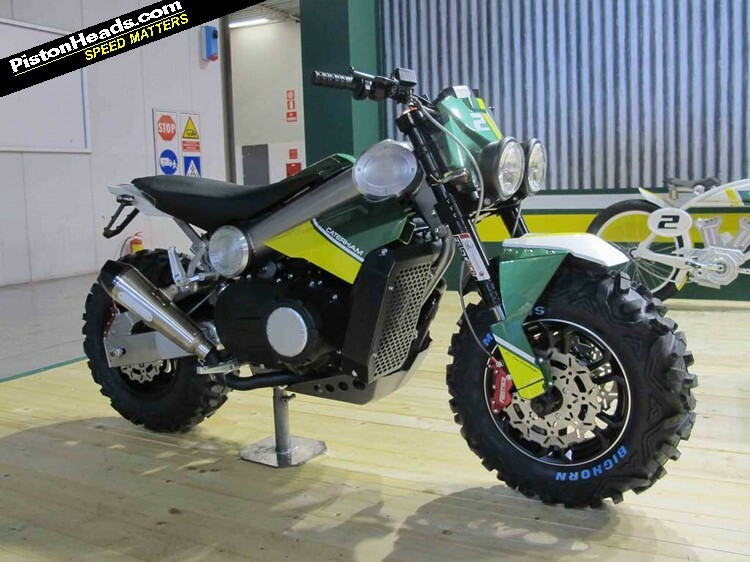 Why have Kawasaki built a 299cc scooter? In Europe scooter sales are big business and Kawasaki want a slice of the action. The J300 is a large capacity machine rather than a 125 as dealers felt that a bigger bike was more in keeping with Kawasaki ethos and spirit. If it takes off, Kawasaki is looking at increasing as well as decreasing engine capacity in a range of scooters. One new bike from MV, the Turismo Veloce 800. Destined to arrive in late 2014, the Veloce 800 uses the firm's 798cc triple with a new engine management unit to improve throttle response and also add an 'auto blipper' to allow clutchless shifts. 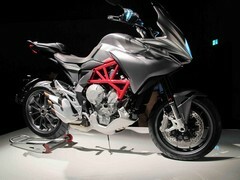 Like the Brutale its gets eight traction control settings, three fuel modes (plus one custom map) and a claimed 125hp. However the Veloce adds ABS as standard into the equation. The frame is all new, the fuel tank a decent 20 litres and the rear wheel is also unique to this bike as is a very neat colour LCD dash. Fully Bluetooth enabled, it can act as an interface between devices such as GPS and phones. 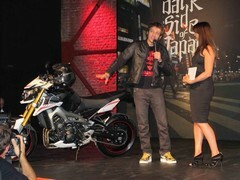 MV also unveiled a limited edition 'Ago' F3. Each bike will be personally signed by the great man and features an Italian flag style paint scheme. 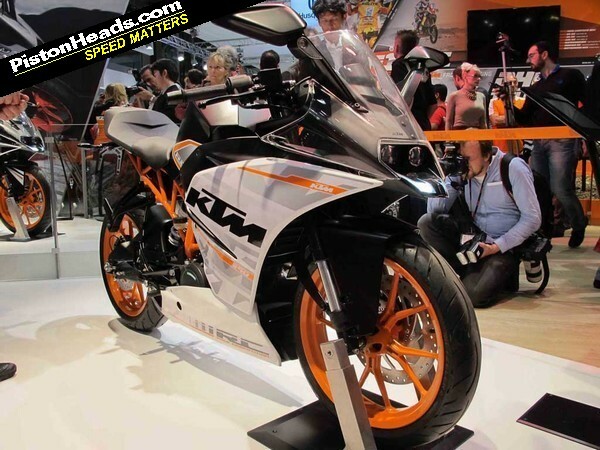 The only new bikes for KTM at Milan were the small capacity faired RC range. The RC125, RC200 and RC390 all look amazing but their best feature is the foam pillion seat/single seat unit. Absolute genius! 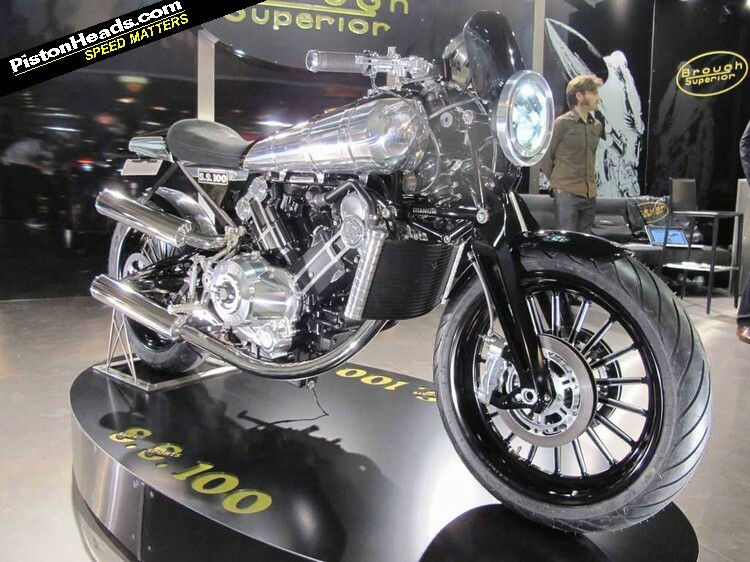 These bikes deserve to sell by the bucket load, and they probably will. Apologies, I just didn't get any of Caterham's three bikes. What the hell is the Brutus and what is the point in it? 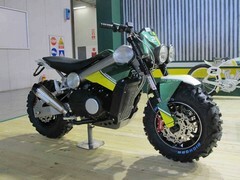 This bike was being punted about last year as the OVER Brutus, now it is a Caterham? If someone can enlighten me I'm all ears but with Caterham claiming production will start in spring I simply don't believe it. Another dismal show for Suzuki was rounded off by...nothing. Nope, not a thing. 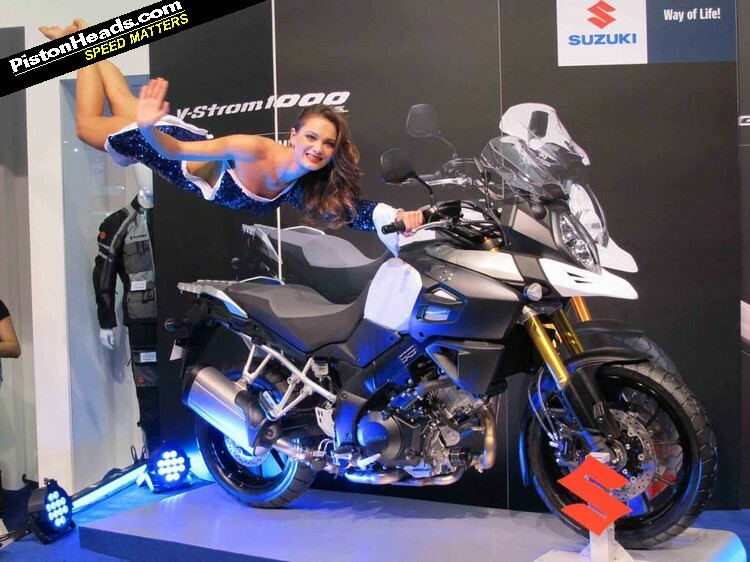 The V-Strom 1000 has already been seen and aside from a posed-up model hanging on behind the bike, they were embarrassingly short on anything at all. 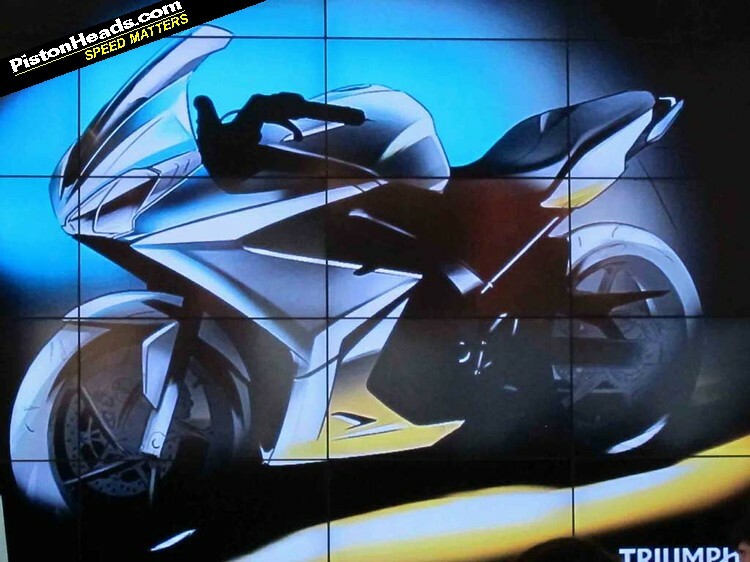 Come on, rip the fairing off a GSX-R1000 and let us have a naked version! Anyone else thinking Katana? That KTM at the top of the page has very similar lines. I was wondering how a November show can be billed as "The first major show of the year"? Bike years are different to normal years, a bit like magazines when the January edition comes out late November. This is the first MY2014 show. That's why. 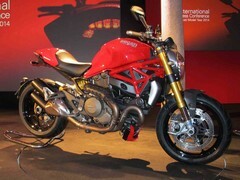 There used to be one either in Cologne or Paris in September for the upcoming MY, but currently the EICMA is the biggest show in town. How horrid are those Harley gaters.... Very Waso pattern part look.